Japan Trip – Day #4 – More of the same and that’s GREAT! Here’s a good one…at 8am, I got into a car with a young guy – he speaks no English – I sit in back seat and we go to Tokyo – I guess this is the way to look at it – it is a trust exercise minus the falling into the arms of a bunch of young people. What do you call it? I was reflecting during our 2 1/2 hour drive to Tokyo – seeing what happens here in Japan reminds me of what I have read about New Testament times. Yesterday when I was walking the pathway to the 1000 year old Buddhist shrine, it reminded me of Ephesus…tons of people, honoring other gods, burning incense, honoring their ancestors and false gods as Lord..at the same time, there are a handful of followers of Jesus who are attempting to honor God in the midst of a pagan culture…it was very inspiring and awesome. I understand that these people who love Jesus and gather in His name are not into "show"…they are not into the worship spectacle or even worried about being effective or having a consumer-driven presentation – they are purely into love, fellowship, and spiritual growth/love for Jesus. Their building is not for attractional purpose – it is for housing the fellowship – it is not the focal point. According to every person I've talked to, their homes are the focal point – relationships are focal point. These brothers and sisters of ours don’t talk numbers, they talk people…they don't talk about the "pastors", they talked about their responsibility and the honor they have of being on a mission for Jesus. You see, the way they see it – it isn’t anyone else’s responsibility to bring the Gospel to their friends and neighbors…it is their own responsibility…the responsibility and calling of living the Gospel and sharing Christ is not given to the pastor, etc…their passion and the visible means of their "success" (my word, not theirs) is each believer's faithfulness to God and His call. we drove over 120 miles today – the freeways were clean…not a spot of trash anywhere. 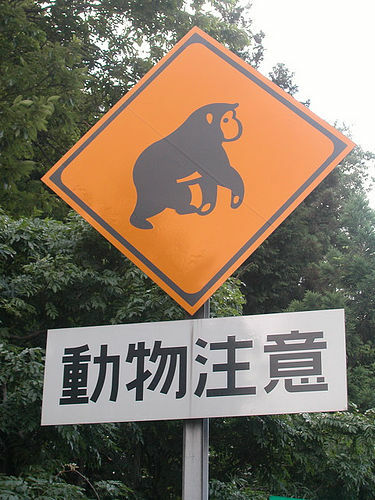 I saw a bunch of "monkey crossing" signs – "watch out for those monkeys" -it made me laugh out loud! Japanese toilets – they are a thing of beauty! You can spend the day on one – they have heated seats, fans, and other "anmenities" that are hard to describe! rest stops on the highway, they are HUGE – like grocery stores, with food available, gas stations, vending machines…they are clean, they smell good – tell you what, on the road, you are treated like royalty! people wear masks everywhere…surgical masks…I'm assuming this – when you are sick, you wear a mask to stop the spread of colds, etc. to other people! How considerate! Less than 20% of women work in Japan – when they are married, there is less of a percentage (close to 10%) – males work and support the home (oh, the good old days). 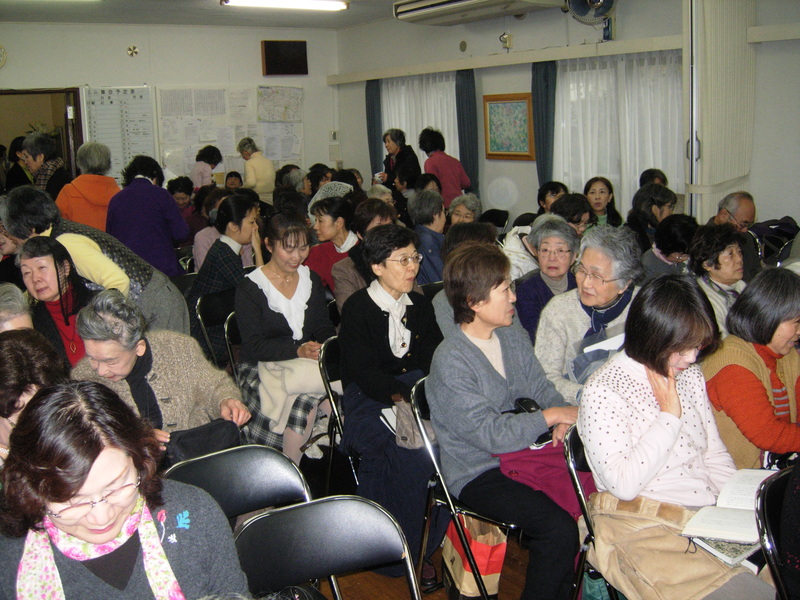 My driver, Chida (pronouced, "chee-dah") and I made it to the bible study in Tokyo…it was packed …I took pictures before everyone arrived and it doesn't do the crowd justice…at least 200 people in a small room…it is obvious that physical comfort isn’t a motivator or deterrent from being taught in the Word of God – my “interpreter” Izumi – grew up in Chicago – she explains to me that this assembly of believers is based upon people feeling free to gather together with other believers to worship and grow – there is no membership in this "ekklesia" (church) – everyone participates…for the house gatherings, the word is spread by internet. The goal is to invite friends “who are suffering” because we all know that the answer to people's suffering is in Jesus only. The people who are part of this spiritual assembly invite their friends to home gatherings first where they hear a message and sing – then people fellowship and share food together. The home gatherings are the first "line" of sharing the faith – everyone understands that people can come to big gatherings but they won't understand the bible readings as much. The home gatherings are where the invitations happens where they can be "exposed" to individuals who know the truth, love the scriptures and love Jesus. Mr. Beck, the original missionary that was the apostolic leader of this movement shared the main bible study – with a smile on his face, the first words out of his mouth were words of challenge. He chastised the people…he said, “616 Christians in our fellowship are participating in a 24 hour prayer circle – we pray for 30 minutes each and every day during a specific time – friends, this year is a year of harvest, spiritual warfare, true worship and revival. We need to wake up from our sleep! It also says in the Word of God that judgment will come on the spiritual house of God first- are you doing what God is calling you to do? Are you sharing with your friends that Jesus loves them and wants people to know Him as Savior and Lord?" After the bible study, lasting 2 and 1/2 hours by the way, I had lunch with Mr. Beck and his wife. 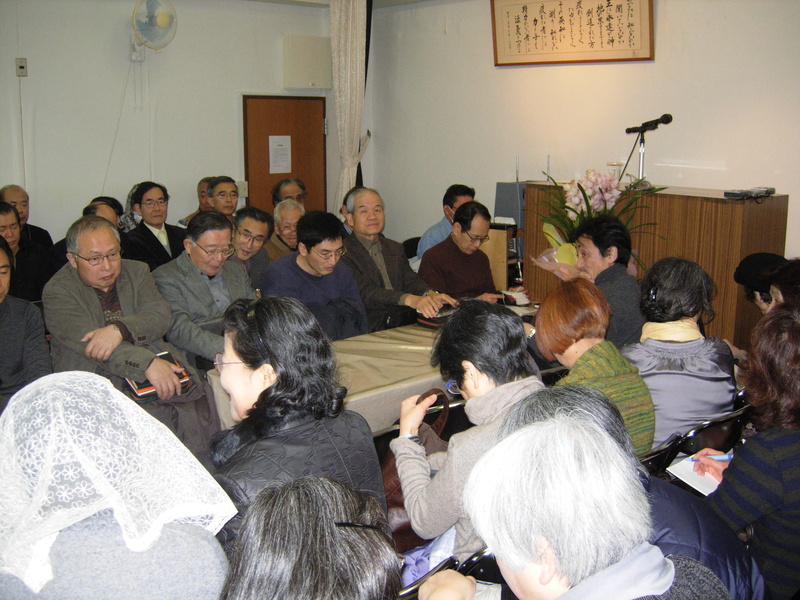 They are 80 years old and have been ministering in Japan for over 55 years. First thing out of his mouth – "the pastors in Japan and other places in the world are the problem…they believe that they are little popes. God wants to use everybody and needs to use every believer to help people come to Jesus. Mr. Beck attends two home meetings per day…seven days a week – this movement includes a nationwide ministry that facilitates 40 worship experiences a week and over 100 home groups throughout the country. And Mr. Beck's story is miraculous…he shared with me that as World War 2 was coming to a close, he was in Germany as a teenager. As the French and American and Russian armies were converging on Berlin, Mr. Beck was intentionally hidden by his mother while his friends were being conscripted into the military along with other young teens and old men to "man" machine guns and protect the motherland. Mr. Beck's friends died during those days…he is hidden by his mom and then goes on a few years later to go to Japan and lead a spiritual movement that leads 100's of people to Christ. Amazing! Well…we left Tokyo in the late afternoon and made our way back to Myoto…it was too late to call my sweetheart…so we had some dinner (nothing scary this time) and then I decided to make my way to bed with a full heart! I'm going to post tomorrow some of the things that this assembly of believers is dedicated to…you will be surprised how simple everything is and how effective it has been for the purposes of the Kingdom! The Spiritual food you are being fed in Japan not only is filling you up, it has overflowed all the way to little ol’ Star, ID. Thank you for day #four. Bill and I send our love and prayers to you and to our brothers & sisters in Christ. We serve a Mighty God! What an experience you are having. All of this will be so insturmental as we at FCLC continue to chart the path for our Faith Community Project. As He made the blind man to see He is truly showing you the path He wants us to follow. His Blessings be with you. It just seems the Lord is leading you to learn, and you seem to be the perfect vessel to fill and then pass it on to others to spread GODS WORD. May he protect you in your travels, we look forward to your return. I don’t know how much you’ve heard about HAITI, BUT PLEASE PRAY FOR THE TLUCEK FAMILY.